Peoples Bank is the first to contribute to a new program started by the Mason County Action Group, Inc., aimed at defraying the cost of feeding local senior citizens. 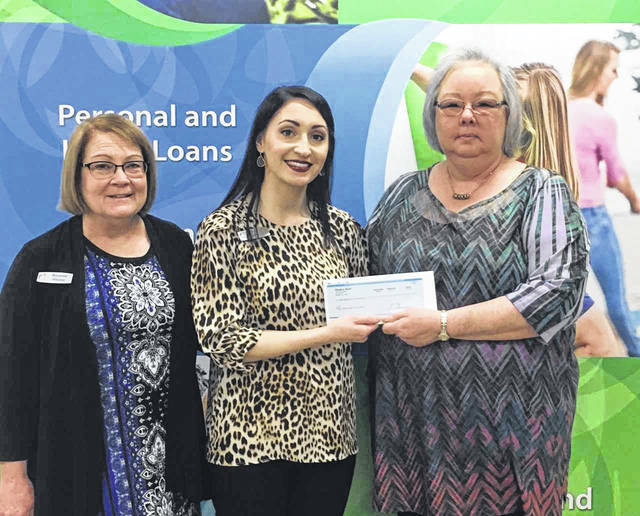 Pictured from left, are 40-year Peoples Bank employee Roxanne Weaver and Peoples Bank Point Pleasant Office Manager Valerie Johnson, as they present a check to Mason County Action Group Executive Director Renae Riffle. POINT PLEASANT — Peoples Bank has become the first to contribute to a new program that is aimed at defraying the cost of feeding local senior citizens. “Senior Free Meal Day,” is an initiative started by the Mason County Action Group, Inc. It was first announced in March, which is National Nutrition Month, according to Renae Riffle, action group executive director. In Mason County, Riffle said about 200 meals are prepared for senior citizens each weekday. The average cost for the food alone is $2.84 per meal. Riffle said the way the meal program works at the senior centers in Point Pleasant and Mason, as well as the Meals on Wheels program, is that the senior agency pays for all expenses incurred for preparing, delivering and serving the meals. The state is then invoiced for the number of meals served that month. She continued that the rates for the reimbursement have not increased since 2009, and the rate per meal is currently lower than the cost of a Big Mac meal from McDonalds. Riffle said some agencies in the state have had to change the number of days per week that their senior centers are open, and reduce the days that they deliver meals to homebound seniors. To avoid that, the county action group decided to start the “Senior Free Meal Day” initiative. For a donation of $568, groups, organizations, businesses and individuals can provide the cost of the food for a day. Valerie Johnson, branch manager of Peoples Bank Point Pleasant office, said when they first saw the initiative, they knew it was something they wanted to participate in. “We believe the Mason County Action Group does a great job providing our senior citizens with activities, social gatherings, and most importantly meals to those who need it the most,” Johnson said. She, along with 40-year bank employee Roxanne Weaver, recently presented the check to Riffle. Anyone wishing to join in the initiative can contact Riffle at 304-675-2369. All donations go directly to support the nutrition program, she stated.